There is something that fascinates me from the new Raspberry Pi, and using it as a media center. It is the fact that is a really small board. That is powered by a micro USB 1000 mhA. That is powered with Linux. I had other media centers before but they were magnetic hard disk, closed in a proprietary system. The media center I installed, with RaspBerry Pi+, is osmc, that is Open Source Media Center. So I have full access via ssh to the RaspBerry, and as it used so few energy I have it all the day up. Then, as it is a Linux box, and I have full access, and I’ve around 546 MB RAM free, I can run as many background process as I want. Do I want to be a jump point for my VPN? Let’s go. Do I want to have some monitoring processes over few websites? Let’s do it!. I’m really happy about having a so tiny, so few energy consuming, full Linux, being my media center and whatever I want to it to do. I must say that is wonderful having SSH and a network interface. Ok, it’s 10/100 Mbps, not Gigabit, but it is enough to allow me to copy new files in background to the USB stick via SFTP while reproducing at FullHD Blueray MKV, files right. Also allows to mount network folders via NFS or SMB amd play from them. Copying via SFTP to the USB device is generally very slow -don’t be surprised to upload at 30 KB/s- so I recommend to set a NFS folder in the computer, with read access to the ip of the Raspberry. It’s very cool and plays totally smooth using the 100 Mbit ethernet connection. You can also configure a FTP in the Pi, that will be much faster than the SFTP. The RaspBerry micro SD card has a performance of ~22 MB, that is enough to boot very quickly and to load programs quite fast. I have other microSD cards with Debian Jessie, and I load PHPStorm (Java based PHP IDE) quite fast. It boots really fast, in case you stop and start it frequently. It accepts my wired Mouse and Keyboard, and also wireless bluetooth. 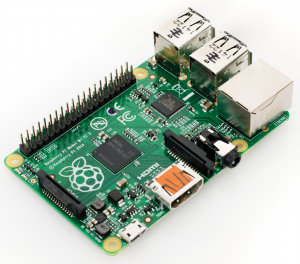 This tiny RaspBerry 2, has 4 cores at 900 Mhz. As you see, it scores only 38.40 bogomips, compared to my tower desktop 6384.59, and my old laptop 2593.45, but it’s still beautiful. It also comes with wget 1.16 and curl 7.38.0. 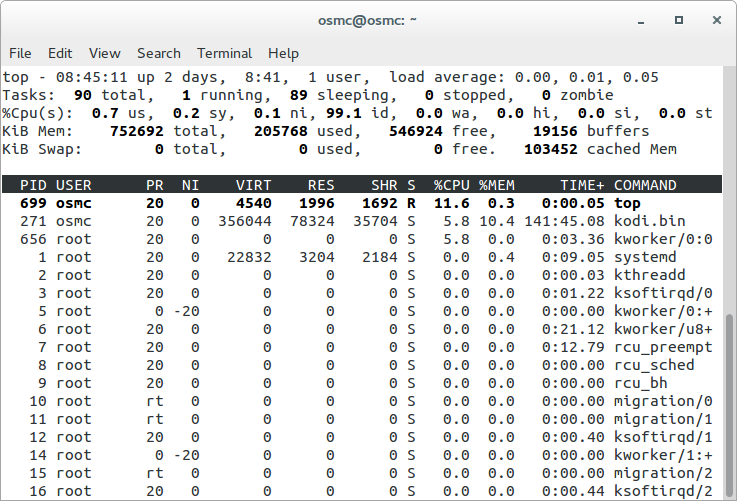 In fact the OSMC is based on the Debian Jessie distro. The OSMC software also have upgrades, and Debian upgrades, that keep the Linux box up to date. So that brings a lot of possibilities. After a sudo apt-get update I was able to install htop, mc and apache2. Note: Although a 1000mhA is enough (Raspberry Pi 2 needs around 700mhA) if you plan to plug a cheap case 2.5 hard disk without external power -just USB- it will not be enough. In this case I recommend buying a 2000mhA transformer for the Pi, or a external USB hub energy powered (2000mhA otherwise you risk energy from Raspbery + USB hub being to sufficient). If the disk has external power, then you’ll have no probem. Personaly I use USB sticks. When I had my incubator of Start ups some years ago, one of my Start up project was embedding motherboards within screens, and offering the ability to play videos, images, even flash games and animations, and manage and update everything and update contents for a groups of players from the Internet, or based on time triggers. I was finalist for selling my product to a enormous multinational, it was close, but finally a Korean company with a cheaper (and less powerful solution) won. At that time, it was 2004, motherboards were huge comparing to this tiny piece of hardware and I had to deal with different voltage, power consumption, heat dissipation, safety, etc…. so I’m really in love with this tiny piece hardware that doesn’t need even a ventilator or a big dissipation mechanism. 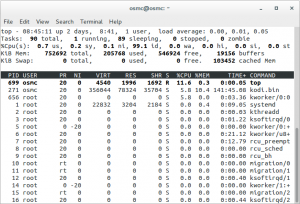 This entry was posted in Casual tech, Hardware and tagged Debian, htop, osmc, RaspBerry Pi, ssh, Start up on 2015-04-06 by Carles Mateo.